Voca People takes its audience on a riveting journey of sound and music. Dressed in pristine white from head to toe (even their faces are white) Voca People present themselves as space aliens whose galactic adventure lands them on planet earth. They then lead the audience through a musical odyssey, performing medleys of selections from hip-hop to opera, disco to the classics. The Voca People perform at San Francisco’s Marine Memorial Theatre through June 17. Photo credit: Voca People. These eight talented singers perform a capella with every instrument expressed through voice. They create rich overlays of sound as they trip seamlessly through the evolution of music from Mozart to the Beatles, Michael Jackson to Queen. As these talented singers are also comedians, audience laughter echoes throughout the show. 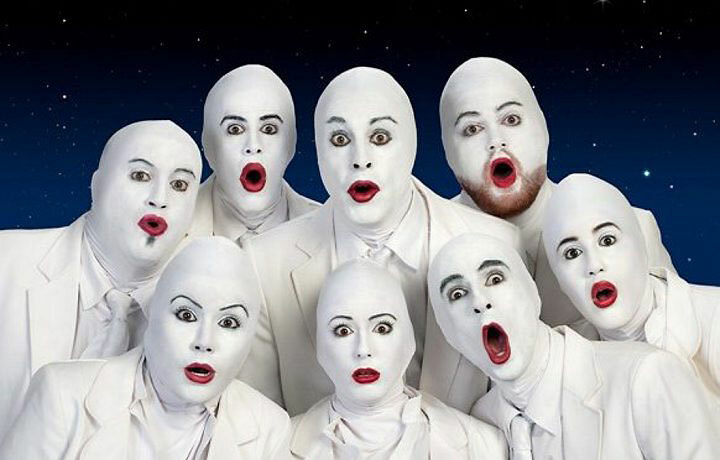 Voca People engages the audience to participate in a way that delights the crowd. At the end of the evening, the theatre audience buzzes with conversation and laughter as the excited guests re-enact their favorite parts, even after the curtain has closed. A novel experience, Voca People is unlike any show you have seen. Do yourself a favor and go. Voca People continues its limited San Francisco engagement through June 17 at the Marines Memorial Theatre. For further information, click here.